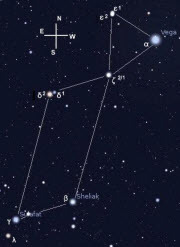 Amongst all the double stars visible in the heavens, there are few more distinctive than the famed Epsilon Lyrae, the "Double-Double in Lyra. It is located just to the northeast of brilliant Vega. The widest two components of the system are easily separated when viewed through binoculars, or with the naked eye under excellent conditions, and through very modest scopes they make for a great view, even under light polluted skies. The only caveat is to wait until epsilon high in the sky (summer and early autumn) when the view is less prone to be blurry due to the atmosphere, turning the wider pair of stars in to large blobs. 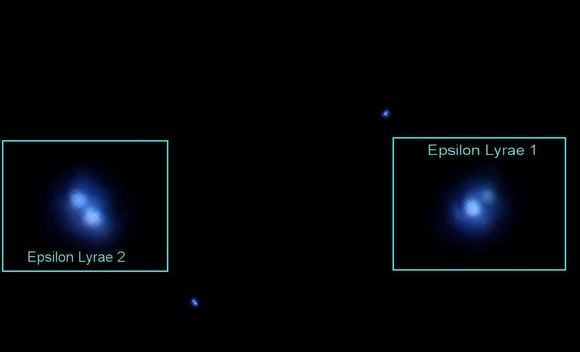 Rather than a single pair of stars Epsilon Lyrae splits into two pairs, Epsilon1 and Epsilon2. The northern component is called ε1 and the southern one is called ε2; The component stars of ε1 have magnitudes of 4.7 and 6.2 and are separated by 2.6", which corresponds to an average distance of 235 astronomical units (1 AU corresponds to 93 million miles –the Earth to Sum mean distance) They orbit with a period of around 1800 years, but the orbit is very elliptical 73 - 400AU. Epsilon 2 component stars have magnitudes of 5.1 and 5.5 separated by 2.3" this equates to 724 years to orbit at a mean separation of 145 AU (95 to 195). Eps-1 and Eps-2 are separated by at least 10,000 AU (0.16 light years) taking at least 400,000 years to complete one orbit about each other. The whole system is located around 161 light years away. The spectral classes of the 4 components are all A, equating to temperatures or just over 8000 degrees K with luminosities of 14 -18 times that of the Sun. The whole system is probably 800 or so million years old. A fifth component of this system, orbiting one of the ε2 pair, was detected by speckle interferometry in 1985 its rapid motion suggests a period of a few tens of years. 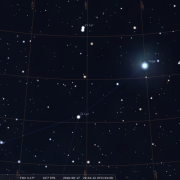 As a double star epsilon is easy to split with the naked eye or binoculars. To spot the double double a telescope is required. Easy-moderate. Crosses the south meridian line at 22:00h on Aug 17th. Binoculars or Telescope at Low-power, Easy. Just 3° East of NGC 6633 residing in the “Cauda” or tail part of the constellation Serpens, lies the almost equally bright, but larger open cluster - IC 4756. Rather strangely it appears this cluster was not discovered until 1908, by Harvard astronomer Solon Bailey, but not visually only on plates taken as part of a systematic search for bright clusters and nebulae. The cluster was then independently visually discovered by German astronomer Kasimir Graff in 1922, only for sources to misidentify or erroneously list Graff 1 and IC 4756 as separate objects until finally rectified, so today the cluster bears Graff’s name and not Bailey’s. The cluster is a fine sight at low power for all instruments up to 10” in aperture, just bear in mind that longer focal length telescopes yield a smaller field of view for any given eyepiece, and therefore the impact of this cluster will be lost. This may be the reason why it was not included or mentioned in historical catalogues or the likes of Messier, Herschell et al. Visually the group is enclosed within a large trapezoid of up to 80 magnitude 5-7stars, with many pairs and clumps in the central portions. 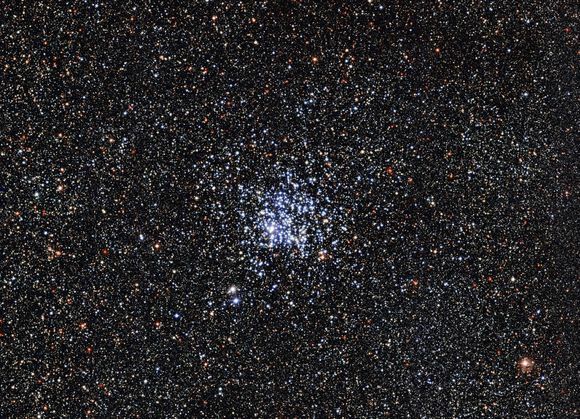 The cluster lies approximately 1300 light years away and is a similar age to NGC 6633. Incidentally, both NGC 6633 and IC 4756 are sometimes referred to as the Tweedle-Dum and Tweedle-Dee clusters due to their proximity in the sky. Both clusters - Binoculars and /or scope at low power –easy. Cross the meridian line around Aug 12th – 21:50–22:10h. The Wild Duck Cluster (also known as Messier 11, or NGC 6705) is an open cluster in the constellation Scutum. It was discovered by Gottfried Kirch in 1681, with the English astronomer William Derham first to resolve the cluster into stars around 1733. Charles Messier included it in his catalogue in 1764. 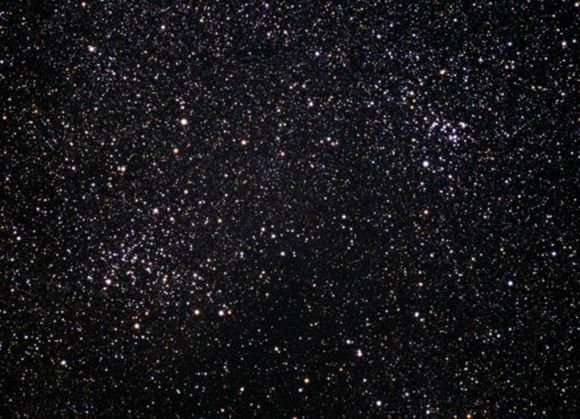 Of the 26 open clusters included in the Messier catalogue, M11 is the most distant that can be detected with the naked eye. 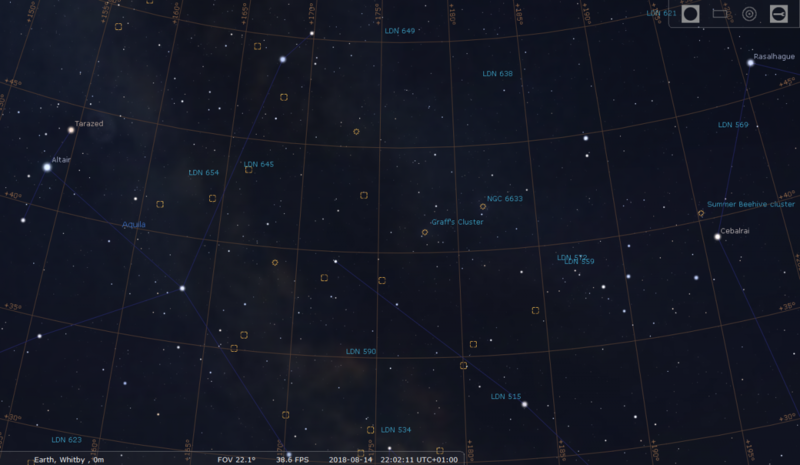 It is also one of the few open star clusters in the Messier catalogue to have been observed by HST. 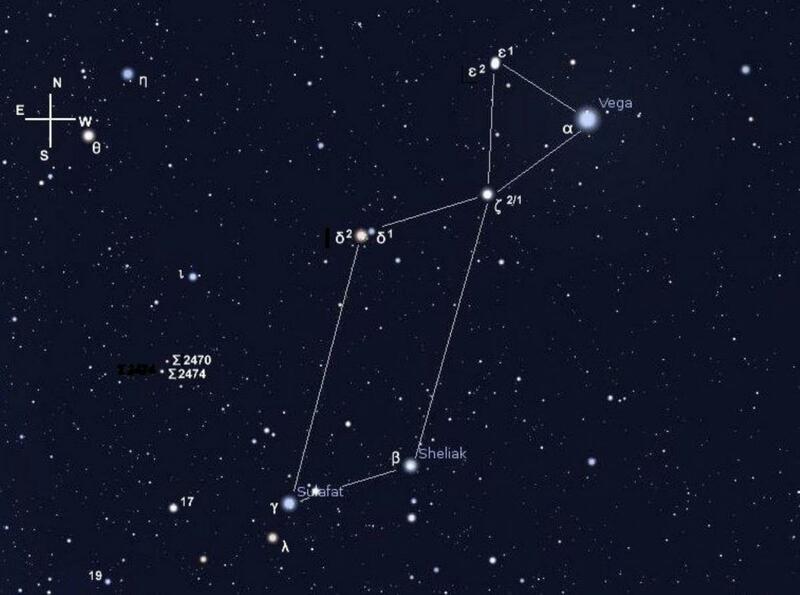 When observed in a small telescope, however the brighter members of the cluster form a V-shaped triangle which sort of resembles a flock of ducks, which is how M11 got its name. 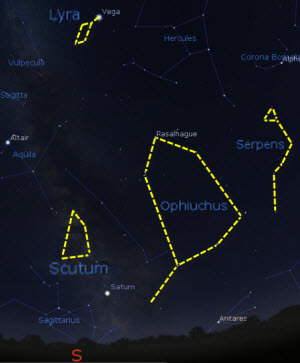 The Wild Duck Cluster lies close to the northern part of the Scutum Cloud, a large star cloud that marks one of the brightest sections of the Milky Way. 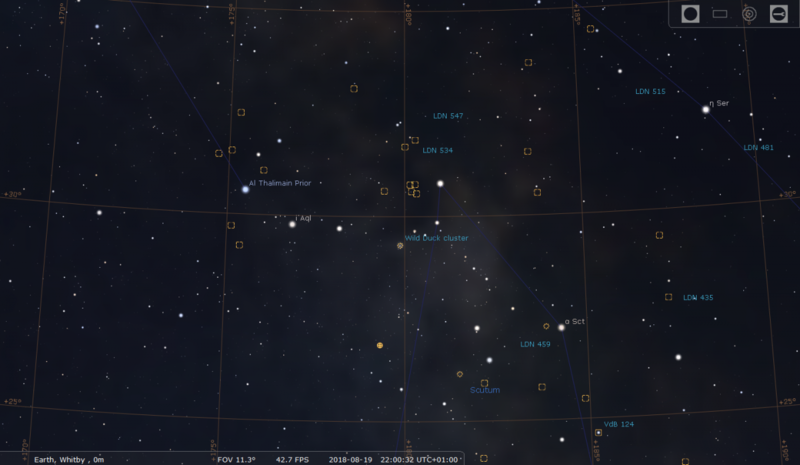 Messier 11 lies about a degree to the northwest of R Scuti, one of the first variable stars known discovered in 1795. 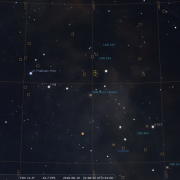 In dark skies M11 appears as a patch of light just over 2 degrees west of the star i or 12 Aquilae, which lies just to the SW of Lambda Aquilae (Al Thalimain prior), the end star of Aquila whose chief star is Altair, southern most of the summer triangle stars. 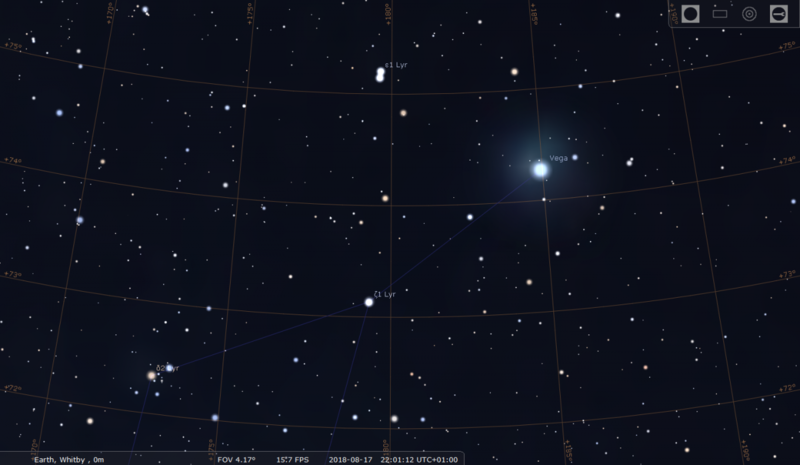 At Magnitude +6.3 M11 is an easy binocular object, appearing as a diffuse fuzzy ball with a noticeably brighter centre. Smaller scopes will resolve M11 into a swarm of sparkling stars, with one bright standout member near the group's centre. When viewed through a larger 200mm (8-inch) scope, M11 is a spectacular sight with hundreds of stars visible including some yellow and red stars. Eye (just from dark sites) Binoculars and a Telescope – easy. 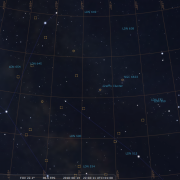 Crosses the 180 degree S meridian line on Aug 19th at 22:00h.